The location of the secret meeting between Rose Maylie, Mr. Brownlow, and Nancy is the south landing steps of the new London Bridge, built between 1824 and 1831 to replace the decayed mediaeval structure of familiar rhyme. That night, and the next, and the next again, the spy sat booted and equipped in his carter's dress: ready to turn out at a word from Fagin. Six nights passed — six long weary nights — and on each, Fagin came home with a disappointed face, and briefly intimated that it was not yet time. On the seventh, he returned earlier, and with an exultation he could not conceal. It was Sunday. . . . . They walked onward, looking about them with the air of persons who entertained some very slight expectation which had little chance of being realised, when they were suddenly joined by this new associate. They halted with an exclamation of surprise, but suppressed it immediately; for a man in the garments of a countryman came close up — brushed against them, indeed — at that precise moment. "Not here," said Nancy hurriedly, "I am afraid to speak to you here. Come away — out of the public road — down the steps yonder!" These stairs are a part of the bridge; they consist of three flights. Just below the end of the second, going down, the stone wall on the left terminates in an ornamental pilaster facing towards the Thames. At this point the lower steps widen: so t hat a person turning that angle of the wall, is necessarily unseen by any others on the stairs who chance to be above him, if only a step. The countryman looked hastily round, when he reached this point; and as there seemed no better place of concealment, and, the tide being out, there was plenty of room, he slipped aside, with his back to the pilaster, and there waited: pretty certain that they would come no lower, and that even if he could not hear what was said, he could follow them again, with safety. To heighten the suspense of the clandestine meeting, the 1868 stage adaptation at the Lyceum substituted Bill Sikes and Fagin for Noah Claypole in this critical scene, which was the basis for the theatre's promotional poster, which alludes to Franklin Dyall as Sikes, and Mary Merrall as Nancy, implying that Nancy's murder rather than the death of Sikes and the arrest of Fagin is the adaptation's climax. The new, wider bridge designed by John Rennie to accommodate increased traffic was itself torn down in 1968. The plate's setting, carefully reproduced in the stage set as the poster, is now thousands of miles from England as "Nancy's Steps" from the Surrey side, like the rest of New London Bridge, have since 1973 been in Lake Havasu City, Arizona, transported and reassembled stone by stone. In the celebrated 1838 illustration, Cruikshank realises the moment when, having tracked Nancy across the East End, Noah overhears Sikes's mistress disclosing the plans laid by Fagin and Monks to ensure that Oliver will never come into his inheritance. 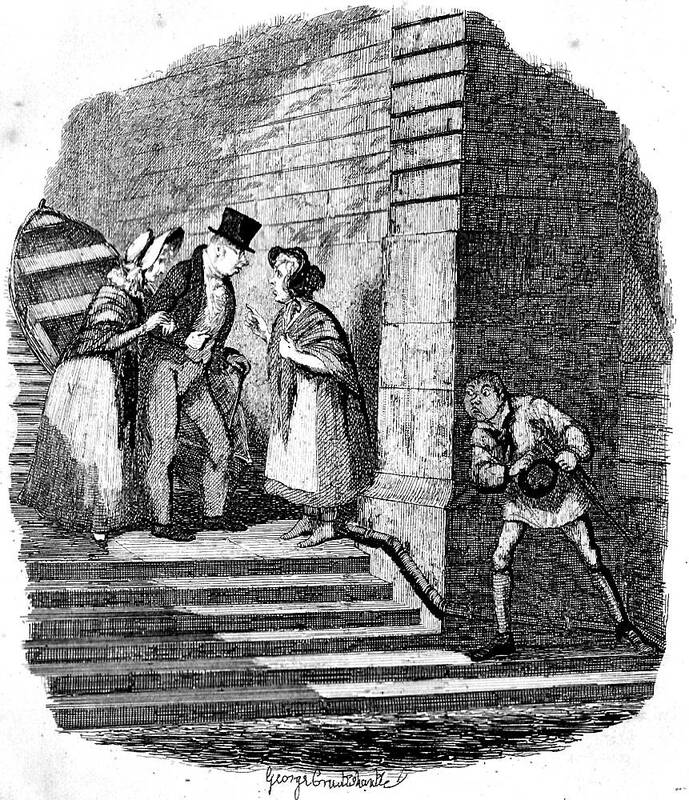 The boat somewhat improbably perched on the upper stairs (left) suggests that the scene occurs by a river, and the trio bend their heads together as the respectably dressed Brownlow and Rose with rapt attention listen to Nancy as she gestures, their postures repeated in the attentive stance, head leaning in, of Fagin's spy, Noah Claypole (right). The illustration captures the attentiveness of the listeners, but fails to convey Nancy's extreme agitation, as she imagines Sikes exacting retribution for her betrayal of the gang. Although Cruikshank enjoys placing the essential comic character, Noah, in this deadly serious scene, foregrounding him as the rapt listener, "Morris Bolter" (the alias which Fagin has bestowed upon Noah), may not accord entirely with the tense atmosphere of the scene as described by Dickens. Noah grips his hat and stick to prevent inconveniently dropping them as he turns his attention entirely to overhearing the dialogue between Nancy and the two respectably dressed "coves". Having reported what he has overheard to Fagin and Sikes back in their lair (including Nancy's having drugged her common-law husband), Claypole seals Nancy's fate. Cruikshank's illustration amalgamates figures from the middle-class and Newgate plots, and also incorporates the charity boy from the very beginning of the story; by implication, Fagin, Monks, Sikes, and Oliver are present since they are very much on the minds of the three characters depicted. The unmasking of Monks as none other than Edward Leeford, Oliver's half-brother, his true name and identity revealed by the "Mark of Cain" that he bears as the outward and visible sign of his spiritual deformity, "A broad red mark, like a burn or scald" (264) upon his throat. 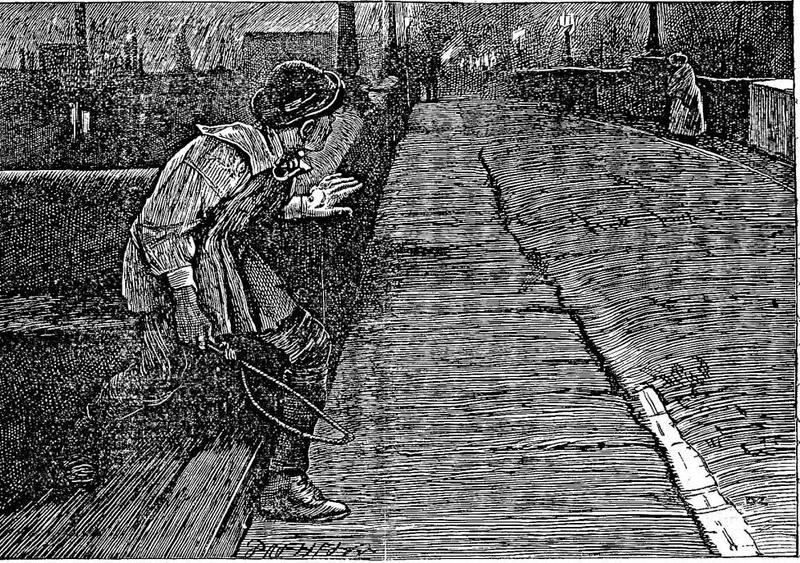 Dickens's original readers must have welcomed the physical setting of the scene as the story now enters their world, the geographical milieu of the City, under the bridge completed only seven years earlier, a recognizable feature of the cityscape that brings the fictional world of Oliver into the real world of the 1830s. 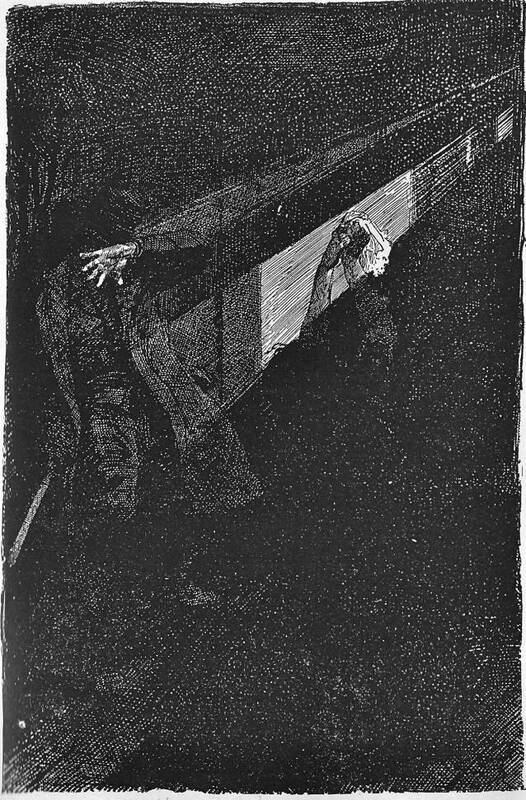 Whereas Harry Furniss in his 1910 lithograph offers a reworking of this famous scene, the 1870s Household Edition illustrator James Mahoney builds up the suspense by focussing on Nancy's shadow, the amazingly adept spy "Morris Bolter," still dressed in his countryman's linen smock-frock. 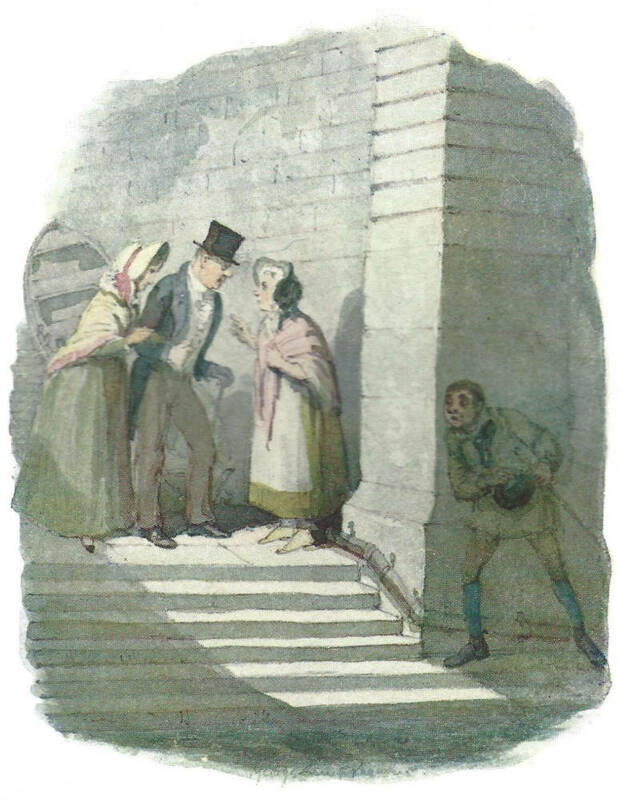 Instead of realizing "The Meeting," the Household Edition illustrator depicts "Morris" at ground level on London Bridge as Nancy (upper right) awaits the arrival of Mr. Brownlow and Rose Maylie (upper right), his perspective shifting from The hunted to the hunter, so to speak. In "When she was about the same distance in advance as she had been before, he slipped quietly down, and followed her again", Mahoney eschews comedy entirely, and subordinates the element of satire to the mystery surrounding Oliver's birth and his gentlemanly persecutor. Clearly for Mahoney the creation of atmosphere and the sustaining of suspense are more important than trying to outdo the original illustrator's handling of the meeting. Whereas Cruikshank provides visual continuity by placing Oliver as the eponymous character in fourteen of the twenty-four monthly illustrations (the majority of these being in the first half of the novel), Mahoney depicts Oliver in only ten of the twenty-eight wood-engravings, Sikes and Fagin appear in five each, and Mahoney has signalled the importance of Monks (Leeford) by placing him in the only full-page cut, the frontispiece and a further three times. Often Mahoney subordinates such lesser figures as Noah to the setting, thereby emphasizing the importance of the figures whose faces we do see. In Furniss's illustration, a curious Noah peers around a pillar to observe the meeting, the illustrator signalling Nancy's agitation by depicting her dress almost in motion, while Rose's dress is perfectly still. 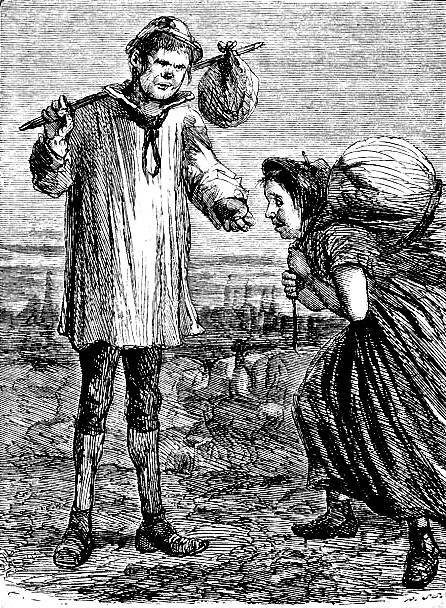 Goggle-eyed, Noah carries the carter's whip that Mahoney gave him in the 1871 illustration. The arches of the bridge now dominate the scene, and one has little sense of the landing-stairs as Furniss has moved in, as it were, for a closeup. A Note Regarding the Serial Placement of "The Meeting"
The Pilgrim editors, Madeline House and Graham Storey, note that the illustrations referred to are "The Meeting" and "The evidence destroyed"; the portrait was of Charles Dibdin. That "The Meeting" should appear in the December 1838 makes perfect sense since this scene on London Bridge occurs in Chapter 46 (which, according to Paul Davis, was the third and last chapter in Part 20, although J. Don Vann shows it as the first chapter in Part 21, January 1839). However, "The Evidence Destroyed" realizes a scene in Chapter 38, the first in Part 17 (August 1838). The only way of testing the validity of the Pilgrim Editors' identification of the two December 1838 plates would be to consult Bentley's Miscellany itself. Clearly, Cruikshank produced twenty-five illustrations, including the so-called "Fireside" plate which Dickens had the illustrator replace for the twenty-fourth (April 1839) instalment. The entire run begins in February 1837, but skips June 1837, October 1837, and September 1838 [Davis, Charles Dickens A to Z]. J. Don Vann in Victorian Novels in Serial (MLA, 1985) notes that the death of Mary Hogarth (7 May 1837) prevented Dickens from writing the instalment for June. The first and second set of Mudfog Papers, which Dickens presumably wrote earlier, appeared in Bentley's for October 1837 and September 1838 respectively. Dickens, Charles. The Adventures of Oliver Twist; or, The Parish Boy's Progress. Il. George Cruikshank. London: Bradbury and Evans; Chapman and Hall, 1846. Dickens, Charles. Oliver Twist. Works of Charles Dickens. Diamond Edition. 14 vols. Il. Sol Eytinge, Jr. Boston: Ticknor and Fields, 1867. Dickens, Charles. Oliver Twist. . Household Edition. Il. James Mahoney. London: Chapman and Hall, 1871. Dickens, Charles. Oliver Twist. The Annotated Dickens. Ed. Edward Guiliano and Philip Collins. New York: Clarkson N. Potter, 1986. Vol. 1. Pp. 534-823. Dickens, Charles. The Adventures of Oliver Twist. Works of Charles Dickens. Charles Dickens Library Edition. Il. Harry Furniss. London: Educational Book Company, 1910. Vol. 3. Forster, John. "Oliver Twist 1838." The Life of Charles Dickens. Ed. B. W. Matz. The Memorial Edition. 2 vols. Philadelphia: J. B. Lippincott, 1911. Vol. 1, book 2, chapter 3. Pp. 91-99. Lynch, Tony. "London Bridge." Dickens's England: An A-Z Tour of the Real and Imagined Locations. London: Batsford, 2012. Pp. 131-132.